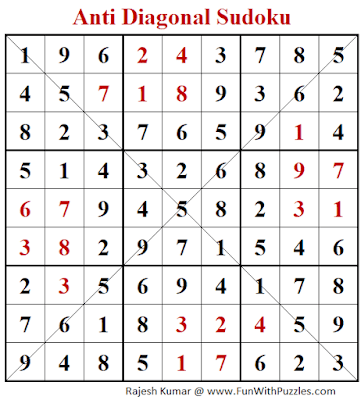 After the Classic Sudoku puzzle, it is Diagonal Sudoku puzzle which is very famous Sudoku Variation. 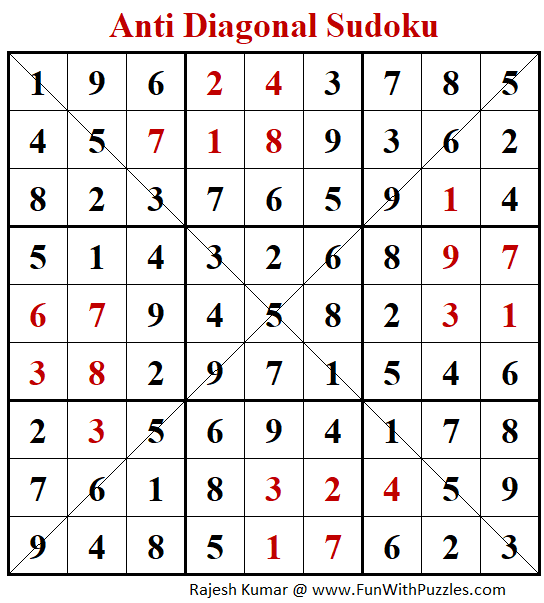 Anti Diagonal Sudoku is very different Sudoku type as compared to Diagonal Sudoku puzzle type. It requires altogether different logic and Sudoku solving strategies to solve Anti-Diagonal Sudoku. So here is one Anti Diagonal Sudoku Puzzle which I am posting as part of Fun With Sudoku Series as 345th Sudoku Puzzle in this Series. 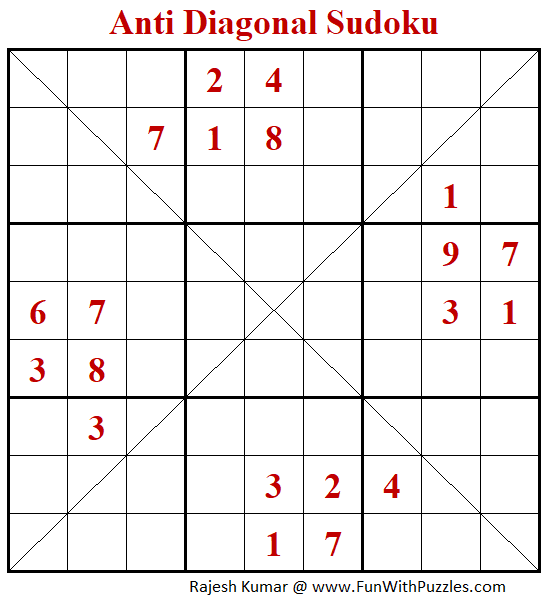 Theme of this Anti-Diagonal Sudoku puzzle is Pentomino symbol P.
Standard Sudoku Rules apply. Additionally every main/marked diagonal contains only 3 different numbers (e.g. 1,4,6). I am publishing this Anti-Diagonal Sudoku Puzzle as #345th Sudoku puzzle in Fun With Sudoku Series. Here are the next are previous Sudoku puzzles published in this series. Thanks for your regular feedback. Feedback for this Anti-Diagonal Sudoku is very quick. Thank for it. 10.25 - it is definitely easier than what my time suggests. Missed some obvious clues for a long time.